I love apples. I love them by themselves, in pie, chopped up in some yummy warm oatmeal, slices dipped in caramel, and I love them when they're made into things like apple butter, apple jelly and apple sauce. 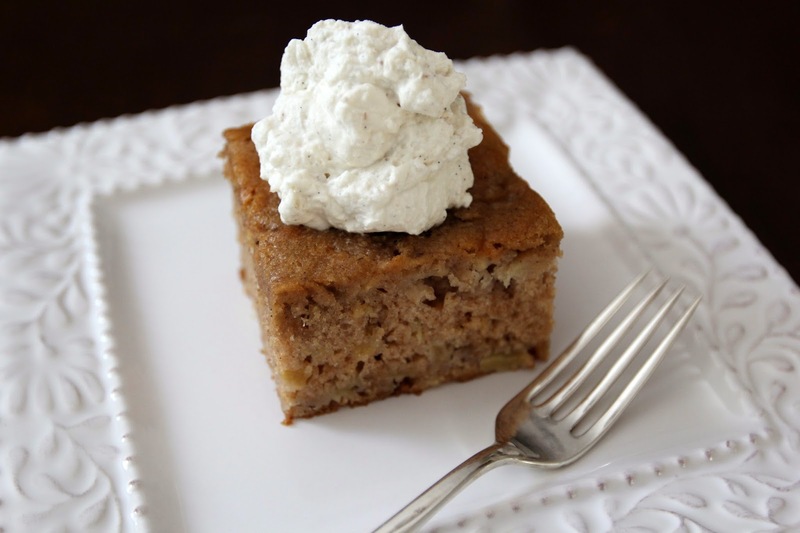 I've had this super delicious apple cake recipe for years and I immediately knew it would be perfect for our Spice House challenge. It makes a nice dessert if you serve it with a big dollop of whipped cream or a scoop of ice cream, or it can be a yummy breakfast all by itself. This time around, I substituted all of the spices called for in my original recipe with Cake Spice from The Spice House. This blend smells absolutely amazing and tastes incredible in the cake. I also left out the vanilla extract and granulated sugar called for in my usual recipe and in the whipped cream recipe, and replaced them with The Spice House's Vanilla Bean Sugar. I'm totally in love with this stuff...I want to put it on and in everything that calls for vanilla extract and/or sugar! The aroma is heavenly and you can even see the vanilla bean in it. I'm not exaggerating when I tell you that the Cake Spice and Vanilla Bean Sugar both added something extra special here. Enjoy! Preheat oven to 325°F. Spray an 8" x 8" square baking dish with non-stick cooking spray. In a medium bowl, whisk together flour, baking soda, salt, Cake Spice and Vanilla Sugar and set aside. In a large bowl beat together eggs, milk and oil. Add dry ingredients and mix well. With a spatula, gently fold in chopped apples. Bake for 40-45 minutes, or until a cake tester comes out clean. Cool and serve with a generous dollop of Vanilla Sugar Whipped Cream. In a stand mixer, beat heavy whipping cream until soft peaks form. Add Vanilla Sugar and continue beating until whipped cream is stiff and holds peaks. Serve immediately or refrigerate until ready to serve.